Warranty - This product is covered by a 30 day warranty, from date of purchase. There is a 15% restocking fee for unwanted product returns and must be in new, unused, uninstalled condition. Disclaimer - Please remove all static from system & dry test before finalizing installation. Consult with or seek a professional technician for installation. Each screen was tested one by one with our board before shipping to make sure it works perfect on your device. If you don't know how to install it, we suggest you to find a professional technician to do for you. Installation guide is not included. Please be sure you know how to install it before buying. Please check the item before you start to install it. If there is anything damaged, please take photos and send to us, we will solve it for you. Otherwise, we are not responsible for any damage caused by installation of this replacement parts. Importance:Only your device original home button assembly will be capable of using the Touch ID functionality. Installing a new home button will only restore ordinary home button functions, not the Touch ID features. Replacement part for any shattered iPad mini 3 Front Panel. This part includes replacement pre-install adhesive strips,offer free adhesive strip for a home button installation. This part does not include replacement the home button assembly. 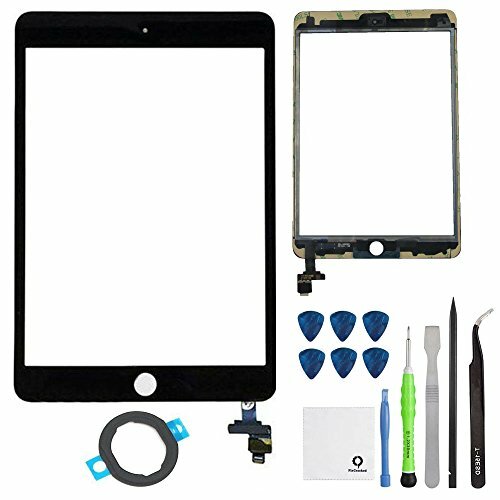 FixCracked for iPad mini digitizer screen repair kit includes 6 pcs iPad tool Kit and the opening tool will allow you to gently and safely separate the iPad mini digitizer from your LCD without using Picks and Pry tools that can crack your LCD. If you have any questions about this product by FixCracked, contact us by completing and submitting the form below. If you are looking for a specif part number, please include it with your message.